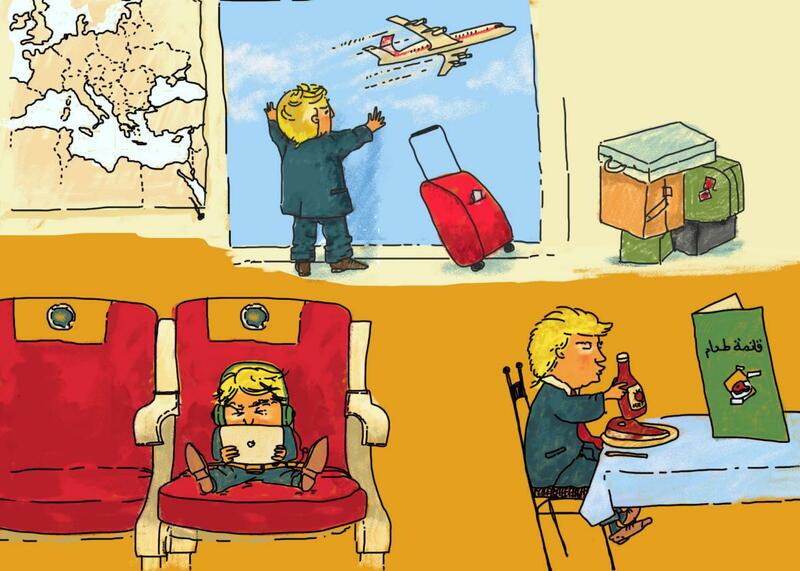 My First Big Boy Trip, by Donald J. Trump. I’m getting ready for my big foreign trip. I will be strongly protecting American interests—that’s what I like to do! The airplane ride is hours and hours. I get lots of screen time! No one wants to give me my phone, but I shout and shout until they say OK.
On the plane, the pilot pins shiny wings to my jacket. Yay! I like planes as much as I like trucks! Our first stop is Saudi Arabia. Jared says it is like a beach, big and hot and full of sand. No girls are allowed on the beach. They eat crazy food in Saudi Arabia, like hummus! But I get to order a steak with ketchup, just the way I like it. Mr. Steve tells me Muslims are the bad guys, but General Jim says I have to be nice to them. It’s confusing! I wish General Mike was here. I’m not allowed to play with him anymore. After Saudi Arabia we go to Israel, where the best Jews live. My friend Bibi sneaks into my room after dark and tells me scary stories about the bad ISIS men. I can’t wait to go home and tell my friends Sergey and Sergey. I don’t want to go to the sad museum. In Italy, they call pizza PIZZA! My teachers tell me that if I sit by myself and think about the long-term economic and security benefits of our multilateral North Atlantic defense regime, I can have pepperoni. I get to meet the “pope”! Don’t tell anyone, but before I left I was a little bit scared about my trip. What if the other leaders laughed at me? What if I had to touch Melania? What if I had an accident? But Ivanka said I should be brave. “Who’s my big brave boy?” Ivanka asked me. It’s been an exciting trip, but when it’s over, I’ll be glad to be home at Mar-a-Lago, where I get as much ice cream as I want.